On October 14th. Hollywood is releasing a major motion picture about birders. It is not an independent film with unknown actors, it features well known stars – Steve Martin, Jack Black, Owen Wilson, Angelica Huston, JoBeth Williams and others. 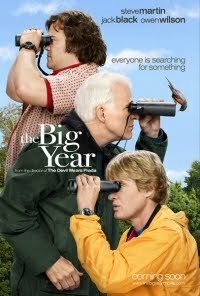 The movie, “The Big Year” is based on the 1998 book of the same name by Mark Obmascik that spent months on the New York Times best seller list. If you haven’t already read it, it is a great read about 3 obsessive birders who each, unknown to the others, decide to set the Big Year record for the greatest number of bird species seen in a single year in the US. I’m guessing that for the film Hollywood changed the story somewhat to make it a comedy. I’ll provide more info on this film, including local theaters, when it is released in October. Maybe we can assemble a crowd of birders and all go see the movie together.